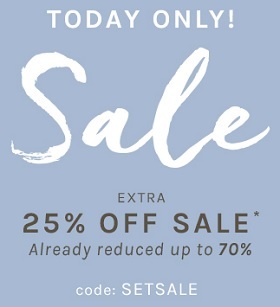 Today is the day when you can get an extra 25% discount on all sale styles. Sale styles are already reduced up to 70% off retail prices. Offer is valid at Naturalizer Canada online only. To receive the offer use promo code SETSALE at checkout. Offer is valid today only (07/21/2016). Official source of the information is Naturalizer Canada. For more information about the promotion visit Naturalizer Canada online.